Try the latest version as I've altered the mouse wheel Q smoothing. I'll give some thought to keeping the nodes visible when the mouse isn't over the window. I was aiming for having it so that the window is uncluttered when you're not hovering over it, but you've come up with a legitimate case for keeping the nodes visible. There's a new version of ReEQ available from the first page/post. More features and refinements planned. I'm not sure if this happened in the latest update, but when loading a project only the 5 first bands/filters are active. Filters 6 and up show up on the graph but they don't actually do anything until you change some value on them. Also, seems to be related that only filters 1-5 are in the parameter list (edit: yeah, that's explained in the first post). Last edited by Paul Eye; 04-10-2019 at 07:36 AM. Thanks for the bug report Paul. I'll fix that asap. As to the first five filters being in the parameter list...it's a limitation of JSFX. It only provides 64 sliders and each filter takes up several. Multiply that up and you soon run out. I exposed the first five so that at least some automation and/or controller assignment was possible. If/when Justin&co increase the slider count I'll expose all of the filters. 256 or even 512 would be useful. Fixed now. Updated version on first page of this forum thread. Would be helpful if the plugin version number (or release date) was added to the zip file name. File in zip is dated April 8th, old? Ugh. Sorry guys, late night programming sessions getting the better of me. 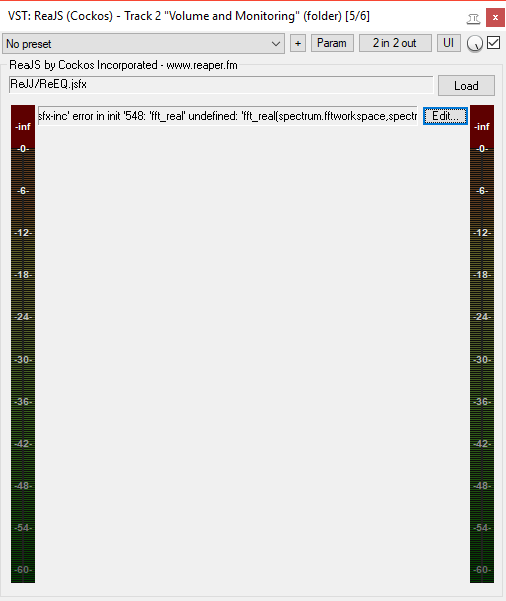 Correct zip with latest ReEQ version uploaded now. Very cool Eq. Thanks. A little request; double click and create a point everything is OK but hard to catch it. Can you make it bigger ? Do you mean make the filter node larger in size or alter the timing of the double click? Bigger node, would be nice. Maybe I need to scale the nodes differently. What resolution monitor are you working on? 1. Having to plug in and use a proper mouse for the 1st time in over 2 years, so I can modify Q values. 2. The higher CPU demand. ReEQ has replaced my Waves Q10 - parametric EQ, for one main reason - it simply sound better, by that little bit. I am using one of the older versions downloaded about two months ago, and absolutely happy with it, though I have - also downloaded the latest version. If it would be possible to add the revisions as additional links/downloads in your original post, so one can always regress to an older version, cos some of us may not need the latest greatest version. Glad that you're getting some good use out of ReEQ! I'll give some thought to the versioning/revisioning. Now would be a good time to do so as the next version is going to have more features still. Really though, version control is nice for more reasons than the obvious. I've had it in GitHub for a while now. Maybe I should provide the link. Still, I think it's almost ready for Reapack. BTW, dropped you a PM. I did further listening today and there is absolutely no doubt, your EQ is very good, adds just that extra touch of "clarity", in comparison to Q10, the end result is simply more transparent to the audio, like the lifting of a veil on the audio. I am not well versed in the maths of filters, far more interested in high quality audio, but your plugin has really opened my ears(eyes) the more to the truth, not all plugins are made equal and equalisers, contrary to a lot of what one hears or reads about, are not equal. At the back of my mind, I suspect that when I read about those clamoring for the use of analog devices and out of the box processing, its possible that it could be the quality of plugins in use, and not knowing any better. What led me to your plugin was an analyzer Schwa Bitter which revealed that Waves Q10 was not producing 64 bit audio (contrary to their documentation - it was more like 40 bits max) so just so I could be sure I was getting proper 64 bit processing, I was searching for an alternative and on testing yours, it definitely was producing 64 bit audio outputs. Then blind testing revealed the improved clarity over Q10. Thanks! Glad you're getting such good use and results from it. Bits probably do come into the quality of DSP. Interesting to hear about comparisons to Q10. Despite the latest face lift it's had, it's quite an old plugin. Originally one of Wave's first I think. New version available in zip on first page. * Optimised HQ mode FIR half-band filtering by reducing multiplies and copy operations. * More improvements to Q handling. Sliders now handle Q as 0..100 (0.10 .. 40) and map linearly rather than logarithmically meaning it'll be easier to automate and better for controllers. I've reduced the multiplies and copy operations for the FIR half-band filter in HQ (oversampled) mode. This affects the base overhead of the plugin. Before I was getting 0.32% - 0.38% for just having ReEQ loaded without any filter bands enabled, now I get 0.20%-0.25%. I've changed the handling of Q in Reaper's JSFX sliders. It's now a 0..100 value range that changes linearly making it more suitable for automation and assigning to controllers. '0' is Q of 0.10 and '100' is Q of 40. For easier operation of the automation, can you add the menu for the last parameter touched? Good catch! Thanks for the feedback. I've added notifying Reaper of the parameter touched for the nodes. It'll be available in the next release. "This is Noam with Waves Tech Support. This information refers to the internal bit processing of the plug-in. This doesn't mean the that output of the plug-in is 64 bit necessarily. It means that the audio path internally processes at 64 bit." So much good it did me, 64 bit internal processing that is truncated to 32 bits on output by the plugin, even when Reaper feeds it a 64 bit input. You must be doing something right. I did a comparison with Fabfilter Q3, 1st time I installed that product. Set up identical curves, I could see that your Q values differ even when they produce the same curves. I checked this with an analyzer - Room Equalisation Wizard. On a low pass, Q=0.71 in ReEQ = Q=1 in Fabfilter. Being absolutely sure I had the same EQ settings in both, on to the listening test. Fabfilter truncates output to 32 bits. ReEQ retains the 64 bits. On a pure blind listening test, ReEQ had a definite advantage on Fabfilter. Fabfilter added this sheen, ever so slight, and deviated from the original audio moreso than ReEQ - using identical settings. I have a fairly deliberate listening and monitoring system - speakers and room, I could hear the difference however slight. Fabfilter adds a certain additional deletion of depth in the bass (leading to apparently more detail, which actually is less detail - like a slight veil over the music, Fabfilter added a certain grit, which my ear learns is more distorton, while ReEQ remained smooth and true to the original audio). This was using the EQ's over a full mix, like in a mastering scenario. using a pink noise test signal, @ -6dB, and reversing phase, of one of the plugins, the residual was RMS of -90dB, yet on real music, I can hear the difference, and the emphasis on the high frequencies, almost like a kind of smily curve showed up in the residual. I hope one day we will have a fully compiled version, your excellence deserves this. Now I've heard what really good sounds like, its difficult to revert to anything else, until we have a compiled version of your EQ, I'd rather take a hit on CPU, and serve the music/audio, for those mix decisions where use of an EQ is unavoidable. Hope this has not changed the audio quality(i.e the audio output/result) in any way, cos that's what I love most about your plugin, very true to the source. I think this may be one good reason to revisit versioning. I have a bug but cannot tell you which version of ReEQ it applies to, since I do not know this, even when I look into the scripts. But the debug message in ReaJS is impossible to read in plain, as some of it is hidden in the user interface as per attached/linked image. There could be a mismatch in JS functionality between whats in the version of Reaper which I use 5.971 and the JS functionality in Reaplugs, the bundle of Cockos plugins which includes ReaJs a VST plugin on Windows that enables execution of Jesusonic apps in non Reaper DAW's. The reason I bothered to attempt to do this is - not everyone uses Reaper and via this tool, at least those on Windows could be introduced to ReEQ. I appreciate that the author of ReEQ is on Mac, but I'll be glad to help deduce what's wrong, with the use of ReEQ outside of the native Reaper JS environment. As you notice above, the Reaper and Reaplugs, I was able to provide a version, but I cannot tell you what version of ReEQ.jsfx I am using, in case someone wanted to check if this is no longer an issue in the newer versions. Or for me to know when the issue is fixed and from which version the fix is effective so I could then download it. Also note that the last update date of ReaJS is before fft_real was introduced. I got a problem with the last update. I can't find the slope rate. Right click on a filter node. For low/high cut filters it's in the 'Slope' submenu. Other filter types don't have this submenu as slope doesn't apply to them. Thanks for the great feedback! Much appreciated. It really means a lot to hear reports of ReEQ in action. Fabfilter's Q values are different to that of most EQ Q values. They decided to make a Q of 0.7071 (standard 3dB) be a value of 1. "Note: Because there are different interpretations of Q values in various EQ plug-ins and scientific papers, we have chosen the value 1 to correspond to the default bandwidth. For the shelf filters, the internal Q values are chosen such that they result in a good range of shelf shapes. Keep this in mind when trying to reproduce the filter shapes of another EQ plug-in in Pro-Q: the interpretation of the Q values might not be the same." Don't worry, it hasn't. It's a removal of redundant operations by taking advantage of the symmetry of the linear phase FIR sinc filter. Yes, I'm going to start tracking versioning in the source now. The ReaJS plugin is completely self contained so it doesn't make any difference if you run it within Reaper. It won't use Reaper's JSFX engine. The version of ReEQ isn't an issue in this case. The fft_real function is a native JSFX function. If it's not supported in ReaJS then that means ReaJS is using an older JSFX code base than Reaper is. IIRC, fft_real was introduced in 2016. According to the Reaper website, the last ReaPlugs update was January 2 2016. I'm figuring that's before the fft_real function was added. And since then there'll be a lot of other bug fixes to JSFX and so on. The best solution to this problem is that Cockos update ReaPlugs/ReaJS. Yea sorry I think I panicked:-) What do you think of bigger node, I mentioned before. Is it possible in the future ?